"We all have ideas to do something creative, but you're actually doing it." For my own sake it's good for me. I'm not a person who seeks the spotlight. I prefer to stay out of it as much as possible. Perhaps the same is true for you. However, I'm discovering that to expand the influence of the podcast I have to be intentional about stepping out from behind the microphone to talk about my experience...to share what I'm learning...and to help others tell their story. For me it's moving from the posture of a student to that of a teacher. There's a market and it's growing. Podcasting continues to trend up and to the right and an incredible pace. It's crazy just how much podcasting has grown over the last 10-15 years. Based on Infinite Dial research 1/3 of of Americans age 25 to 54 listen to podcasts monthly and more Americans are listening to podcasts now than a year before, and they're tuning in at home and on the road. You can read all of the research here. In case you think you're too late to the podcasting game, you aren't. There's no indication it's slowing down anytime soon. It doesn't have to cost an arm or a leg to get started. You need some equipment - a microphone (or two), a computer or recording device, editing software, and a hosting service. How much did I spend? I spent $295 to get started, but I could have started for much less. I didn't have to hire a friend to design my logo for $75. I didn't have to purchase music or headphones. 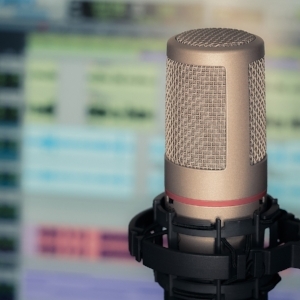 You will need an annual subscription for a podcasting host like Libsyn or Podbean = $94. I spent $49 on recording software, and $41 for a microphone. If you're following my weird math, you can start podcasting for less than $200! That's cheap. Knowing what I know now, I could make it happen for even less! You have an idea worth sharing with the world. As millions (yes millions!) more discover and listen to podcasts each year, there has never been a better time to share your idea or spread your message with an eager and engaged audience. If you're a pastor I want to challenge you to expand your influence through podcasting. Consider how you can engage listeners with a unique message that adds value to their lives. I mentioned I'm a bit of a podcasting junkie. Check out these podcasts by pastors who are sharing a message that intersects their passion with people's curiosity. It's not too late to start podcasting. What message is stirring inside you need to share with the world? Powered by Squarespace. Copyright © 2019 by Joshua Cooper.